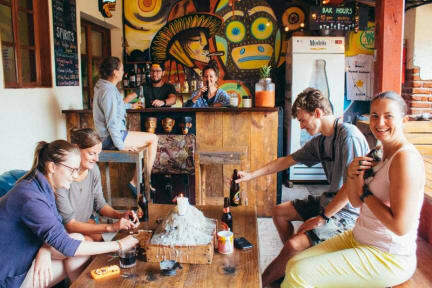 We are a new hostel in Antigua Guatemala, created by people who love to travel and understand what backpackers really need. Friends for a long time, an Aussie and two Guatemalans decided it was time to start a new and fresh place for our friends around the world, and that’s how Three Monkeys was born. Come and be a part of our family! We offer both deluxe private rooms, as well as clean and spacious budget friendly dorm rooms. Enjoy our beautiful garden, our relaxed patio area, and take advantage of our convenient location just a stone’s throw from Antigua’s main square and all the great things Antigua has to offer. Kick back and relax after a long flight or walking around amazing Antigua in one of our super comfy beds. We offer both deluxe private rooms, as well as clean and spacious budget friendly dorm rooms. No matter which one you choose, we guarantee a great night rest. Enjoy a social and fun atmosphere while still keeping a privacy. Our private rooms for up to three people are spacious, clean, and have wonderful natural light, both with en-suite or shared bathrooms or Meet new people without leaving bed! Our dorm rooms are spacious with super comfy beds and large lockers to keep your belongings safe, both with en-suite or shared bathrooms. Check in from 02:00 to 23:00 . Staff was very friendly. 24 hour security, felt very safe. Good atmosphere, clean rooms. Good happy hour! Short walk to everything! Highly recommend. My home in Antigua! I love this hostel and always come back here. All the staff are so lovely and the vibe is always great and social. Open mic on Tuesdays is the best! Nice chill hostel, in the female dorms I had the best sleep ever on the most comfortable bed + soft sheets of my trip. All rooms open into the courtyard and there is no noise isolation, but earplugs are your friends. The staff wasn't the most inclusive I've met on my trip but all very friendly. The common areas are very well thought out and nice to relax in. They have big lockers and will let you store your luggage (if you go to overnight volcano hike for example). Loved my stay. Lovely hostel with comfy beds, big lockers and free pancakes for breakfast. Would recommend to anyone looking for somewhere chilled with friendly staff. If you’re doing the Volcano hike you can leave your belongings there very securely at no extra charge. A chill place to stay in Antigua. Walking distance from everything. Bunks are comfortable with shelves and outlets. Lockers are under the bed. Toilets and showers are in the courtyard. The bar and kitchen are good places to hang out at night. Hammocks, chairs and the terrace are nice for chilling out during the day. Very quiet hostel. A bit far away from the city center relative to other hostels (still only about a 15 min walk). WiFi barely worked when I was there. Free pancakes in the morning. Staff was friendly and helpful.